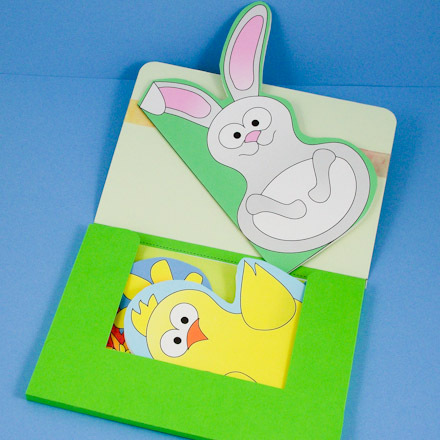 Follow the instructions in this project to make a storage case for holding greeting cards. Make a special gift by combining this case with your handcrafted greeting cards. The printable patterns in this project make three case sizes, including cases sized for the cards featured in the Greeting Card Tutorials. The case can be made in either of two styles—one-pocket or two-pocket. The one-pocket version has one place to insert your cards with envelopes and a cover that folds over the top. The two-pocket version is made of two identical halves that fold over each other. As an added bonus, check out this simple technique for making a see-through card holder. Choose the stationery case size and style that you want to make. For the single-pocket style, download and print one case pattern and one cover pattern of the size selected. For the two-pocket style, download and print two copies of a case pattern. Each copy is one-half of the card case. It is best to print on cardstock, but if you don't have any, print on paper. Important: Compare the size of the card case to the size of the cards and envelopes you plan to store in the case. 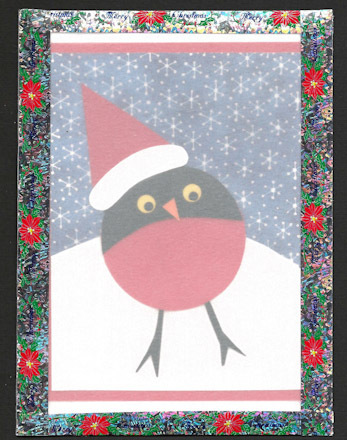 Be sure that the inside rectangle on the pattern is bigger than the cards and/or envelopes. Just lay an envelope over the rectangle and compare. If the stationery case pattern is too small, enlarge it and print again. There are patterns for three sizes of card cases, with black & white, colored and circle design versions. 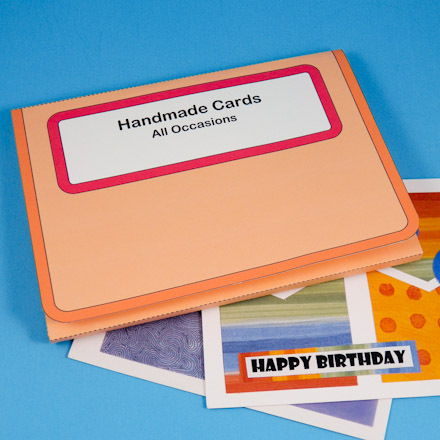 The Standard Card Case is sized for the 4¼" by 5½" cards made in the Greeting Card Tutorials or cards made from letter-size paper folded in quarters. 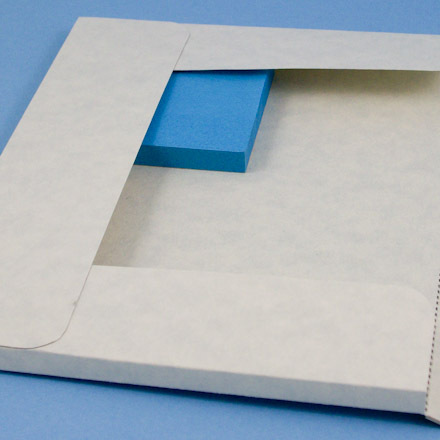 The A4/C6 Card Case works with cards made from A4 cardstock or paper, and the third case fits small business envelopes (#6¾—3 5/8" by 6½"). Editable text patterns: As an added bonus, there are versions of the colored patterns with editable text on the labels. Open the patterns in Adobe Reader and click on the label text to change it. If you printed on paper, it will need to be stiffened or transferred to lightweight cardboard (see how to transfer a pattern). To stiffen the paper, glue another piece of computer paper to the back of the pattern or glue it to cardstock. Be sure that the glue completely covers the pattern. Get it into the corners and along the edges. 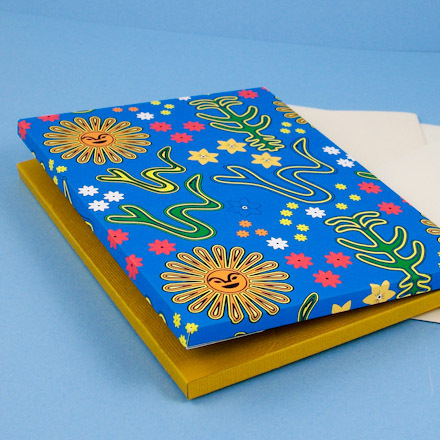 Tip: If you printed on cardstock, you can glue wrapping paper or other decorative paper to the back of the patterns. This is an easy way to decorate your card case. Cut out both patterns on the solid black line. If you are making the single-pocket style, cut the glue tab on the case pattern on its center black line. Try to make the cuts very straight. The case will fit together better with straight edges. It is easier to make straight cuts with a craft knife and ruler. Careful: craft knives are very sharp and should only be used by adults. Flip the case and cover patterns to the printed side up. Score all the dashed lines with an empty ballpoint pen or other blunt tool, placing a ruler along the dashed line as a guide. Working from the outside, fold over on all the scored lines. Crease firmly. Make a sharp crease by running your thumbnail firmly along the fold. Glue the two card case patterns (for the single-pocket style, the case and cover patterns) together on the middle hinge. Let the glue dry before going on to the next step. Unfold the top and bottom flaps. Apply glue where they overlap the side flaps. Fold over and stick in place. Hold until dry. Be sure that the corners are square and even. If you place something in the corner, like a pad of sticky notes or a stack of business cards, it will be easier to form a square corner. Be very neat with the glue, making sure that there is no glue inside of the case pocket(s). You can decorate the outside of the case with stickers, markers, paper cuts, stencils, etc. Use your imagination! Put cards and envelopes in the case, and fold the case in-half. You are done! What cards will you put inside your case? 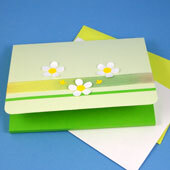 Make this simple greeting card holder that showcases your handmade greeting cards. It's quick and easy to make this holder for one or two cards. 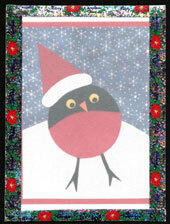 Get a card or envelope of the size you will be putting in the card holder. We'll use it to size the case. 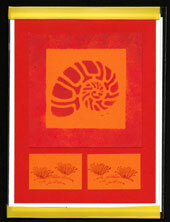 (optional) If you are using vellum, fold the vellum to the depth of the card to create two layers. 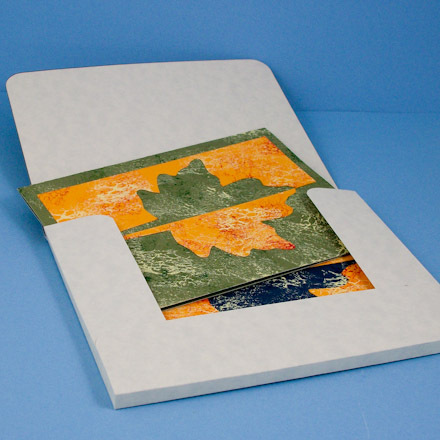 Put the card inside of the folded vellum or report cover. Position it against the fold and ¼" (.5 cm) in from the edge. 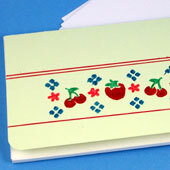 Use the ruler and marker to draw a line ¼" (.5cm) from the other side of the card. 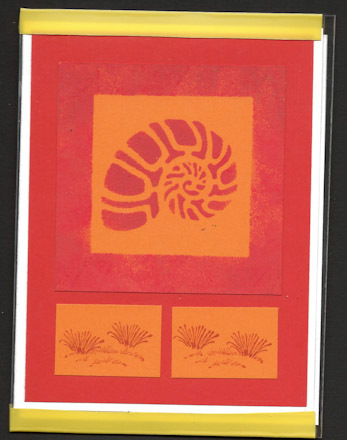 Draw two horizontal lines—one at the bottom of the card and the other 1½" (3 cm) below the card. Cut through both layers on the ¼" line. Cut the top layer on the first horizontal line and cut the bottom layer on the second line. Cut inside the marked lines so they don't show on the case. 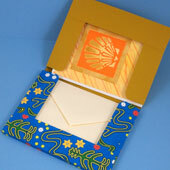 Tape the the sides of the two layers with the decorative tape—this forms a pocket for holding the greeting card. You can use Contac® paper in place of the tape. 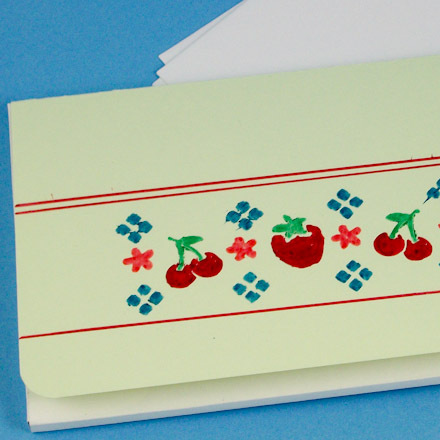 Cut a ½" (1cm) strip of Contac® paper of a color or pattern that coordinates with your card. Fold the extra 1½" of the bottom layer over to form a flap for the holder. Score the fold line with an empty ball point pen to aid in folding. With report covers, making a sharp crease can be tricky. Rolling the fold with a brayer will help. You are all done! 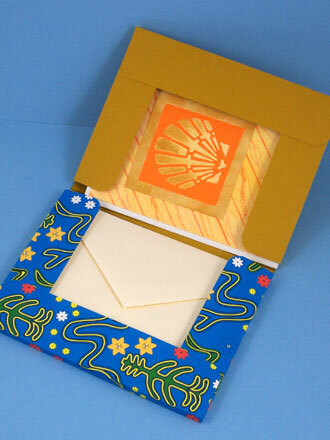 Place your beautiful handmade card in the holder for all to admire! Tip: Use the Assorted Tranquil Circles ePapers, or any patterned paper, to make a Greeting Card Case or print on the reverse of any pattern as a patterned lining. 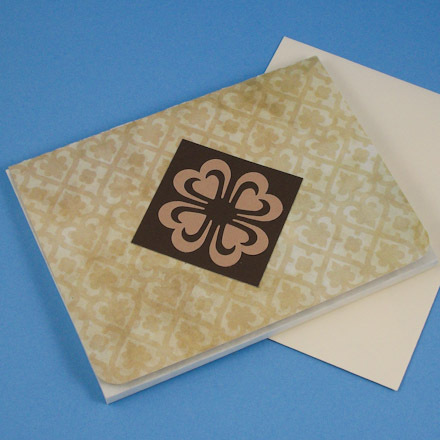 These ePapers coordinate with the Green Tranquil Circles ePapers and the Colored and Circle Design Cover patterns in this project. 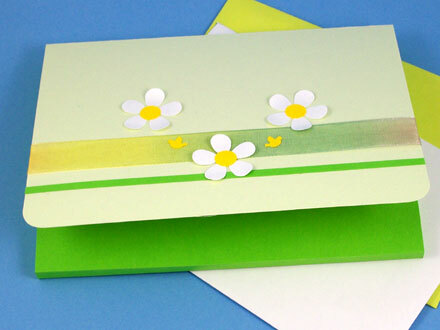 Tip: Decorative paper and paper punches are an easy way to decorate the card cases. Tip: A solid color pocket and decorative pocket make an interesting card case. The printed pocket is made using a white cardstock printed with Aunt Annie's Huichol-inspired ePapers in blue. Tip: Store cards in one pocket and envelopes in the other. Tip: Make a custom label for your card case with one of the Editable Text Patterns. Open the pattern in Adobe Reader, and click on the title or subtitle to edit the text. You can print the pattern and/or save it to use later. Tip: The A4/C6 card case is the right size for Aunt Annie's Shaped Easter Cards. 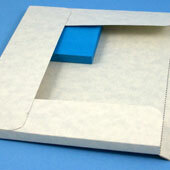 Tip: Placing a pad of sticky notes in the pocket corner aids in gluing a square corner. 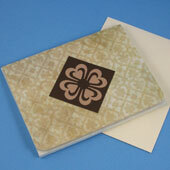 Tip: Stenciling is a nice way to decorate the card case. Tip: Decorate the card case with ribbon and paper punches. Project Extra: Make a quick and easy card holder using a report cover and electrical tape or washi tape. Project Extra: Display your cards in a card holder made from a sheet of vellum and decorative tape.